This appealing homeware and stationery range features a vibrantly colourful poppies motif. All items display encouraging words from Proverbs 31. 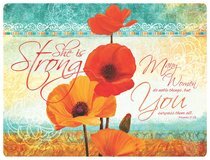 About "Poppies Large Cutting Board: She is Strong"